“Please Nathaniel. It’s been two years. He’s not coming back,” my mother begged. “How can you give up on him?” I yelled. Nat eventually persuades an old family friend to make the voyage, but he accomplishes it with deceit. As they sail, Nat’s dishonesty grows and broadens, finally enmeshing him in a murderous scheme. How did a simple lie grow so monstrous? Will it cost him the very things he holds most dear? Sea Cutter is a cleanly written adventure with lots of positives. It celebrates truth, family, friendship, honor and forgiveness, and it does so with a LOT of excitement. Mr. Davis has sections of absolutely beautiful prose, but his greatest strength is a flair for creating danger. He’s a master of foreshadowing, and each chapter ending leaves Nat in impossible scrapes. The tale twists and turns in some unexpected directions, but some well-planted clues help us guess at others. It’s a fun read for anyone, but boys especially will eat up the exploits of this swashbuckling, brave young hero. 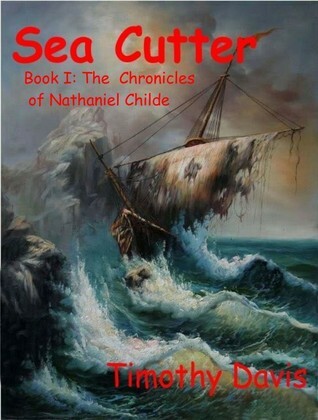 Sea Cutter is just .99 and available as a Kindle download and on Smashwords. The Bookworm Blather Squeaky Award was not in existence when I first read Sea Cutter. However, I’m happy to bestow the honor now. Will check this one out, thanks for telling us about it. Congratulations Mr. Davis! YAYYYY!!! I agree Mrs. Isenhoff -Sea Cutter is an AWESOME adventure book for all age kids (and adults)! Adventure! Always something to love. PS: I received Beneath the Slashings in the mail. Thank you. Reading it right now. My 14-y-o son read the entire book yesterday! Awesome, Barbara! Hope you like it, too! Like I said, recognition where recognition is due. It’s a great kids’ story. It’s especially a great boy read. Lots of excitement.